The rat is the first sign of the Chinese Zodiac. The rats manage to appear relaxed and well-adjusted but in reality they are edgy and tense. Rats are suited well for each other as they both crave the constant intellectual companionship. In Chinese astrology, rat zodiac sign are considered to be a symbol of fortune and abundance. A rat is defined as being quite charming, very aggressive, yet sentimental and family oriented. Rats, all while often being successful and hard-working, are shrewd with their money, can be unruly, and messy. When two rats come together they usually have a successful relationship, whether it be as business partners or lovers. A rat tends to be extremely family focused. Even as shrewd as a rat can be, when it comes to family and others close to their heart, they can be overwhelmingly generous. The Chinese Rat animal sign also have a very strong sentimental side have a difficult time turning down a good deal and can often find themselves spending more money than they have. They will find that they save anything and everything that holds any type of sentimental value to them. Which, with two rates together, you are looking at a home filled with clutter. Don’t worry though rats don’t mind a little mess or clutter. With that being said rats need to work with one another to keep organized. Rat man and Rat woman tend to be loyal, but can get bored without excitement and that can sometimes lead to being unfaithful. With two rats together this should be a minimal problem as rats love excitement. Even in spite of problems, as long as they are not to severe, rats with stick together till the end. They tend to fear being alone. When upset a Chinese rat person can get angry quickly and spend a lot of time arguing or nagging. As long as the two rats can keep from tearing each other down during fights they should be able to remain on good terms. Rats will also find themselves doing too many things at once and this will often lead to them accomplishing next to nothing. In a business relationship the Rat and Rat Chinese zodiac compatibility can be extremely successful. Especially if they can both learn to focus on finishing each task they begin. In general rats by themselves can be wealthy and successful, together nearly unstoppable. A rat needs to be stimulated by discussions and new ideas. If a partner lacks this ability, it won’t last. Chinese Rat animal sign have a hard time attaching and confining themselves to one person if they are unable to stimulate the rat’s extreme curiosity and need for excitement. The thing about rats though, they do have the ability to settle down and remain true to one partner. Once they find their soul mate it’s till the end. These are all reasons why rats make good companions for each another in love and sexual compatibility. While the rat’s impulsive behavior can be great for another rat, at first, it can become trying. Sometimes the Rat’s impulsive nature makes it complicated to depend on one another when you never know what the other is going to do. This can make living together more complicated than just dating, as living together almost relies on some type monotony. Again though, if the Rat male and Rat female find their true soul mate rats can settle into the family life and monogamy. Two Rats can make wonderful partners for one another. 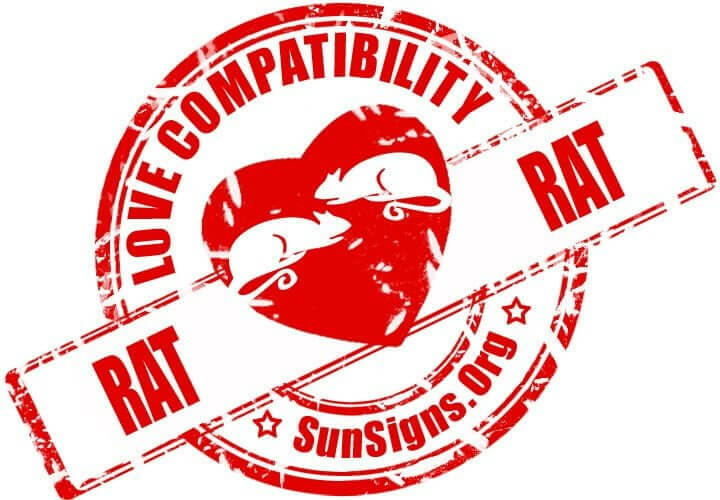 Rat & Rat Chinese Horoscope Compatibility Rated 3 Hearts!